Shellbark hickory is found from western New York west to southeastern Iowa. It ranges south to northeastern Oklahoma and over to Tennessee, with isolated populations in southern Arkansas, Mississippi and Alabama and in northern Georgia (distribution map). Shellbark is usually found on deep, fertile, moist, bottom&SHY;land soils, but in the northern part of its range can occur on dry, sandy soils. Shellbark hickory is a minor component of the Bur Oak forest and, especially in the south, of the Swamp Chestnut Oak&SHY;Cherrybark Oak forest (Fowells, 1965). 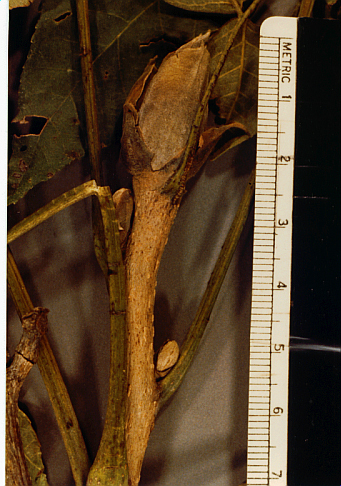 The species is distinguished by its very large buds, stout twigs which are buff to orange, lenticellate and glabrous, and by the very thick (around 1 cm) husks. Nuts are large, flattened four&SHY;angled, cream colored, and thick shelled (4 mm), with sweet kernels. The flavor of the kernels is considered by many to be inferior to shagbark hickory. 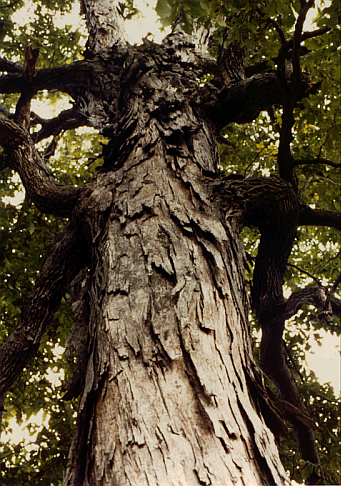 The bark of the tree exfoliates in plates, as in shagbark hickory. Trees tend to be shorter and with heavier branches than shagbark. Often, rachises of the previous year remain attached to the previous seasons twigs. Over forty cultivars of shellbark hickory have been named, with most originating in Iowa or Pennsylvannia (Grauke, 1988). Table 4 gives information on several promising cultivars of shellbark hickory. Shellbark hybridizes with pecan to form C. X nussbaumeri Sarg. 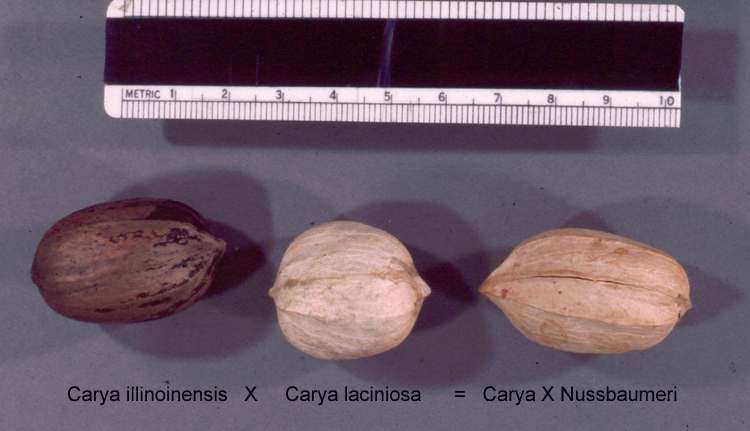 This group of hybrids has attracted attention for their large nut size. 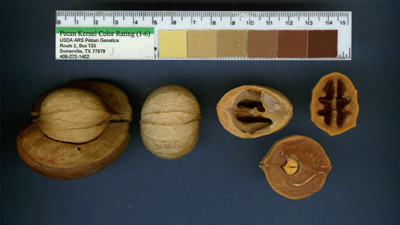 Noteworthy cultivars include 'McAllister', which is widespread, but a poor nut producer, and 'Gerardi', which is recommended as a rootstock for pecan in Tennessee (Thompson, 1984). Shellbark hybridizes with shagbark to produce C. X dunbarii.